I pulled to 7♣, which got doubled in a rage on my right. My LHO was a very ethical player, though... he took inferences only from the auction and not from his partner's table action. So he read this as a Lightner double, and led dummy's suit (spades). I tucked in the nine which brought down the queen. A 3-2 club split later, I racked up 1630 for 7♣X nonvulnerable! East here made two huge mistakes. 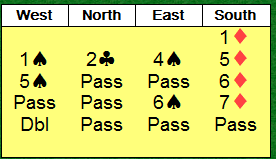 First, he was on lead against 6NT with a solid six-card suit. This should be a situation that you dream about... but he got very greedy. He wanted to turn +250 into +1100. Then he regretted his decision so much that he forgot what a double of a slam means when you're not on lead. I decided not to defend with my 8-5 hand. As it turns out, I could have doubled 6♠ for a fine score - +1400. But that would have lost an IMP! At the other table, my friend Ranald was in 6H just in for 1430. I decided that I didn't need much to make 7♢ a good contract, so I just up and bid it. My LHO doubled and led the ace of clubs. I ruffed in hand, and could see that a successful heart finesse would bring it home. The trouble with finesses, though, is that they sometimes lose. So I looked for a better way to go about it. I cashed the king of clubs, hoping the queen would fall for my 13th trick. Sadly, my RHO showed out, so clubs were 5-3. Hmm... my LHO had 5 clubs and overcalled 1♠. He must be 5215 or 6115! He'd pitched a heart on one of the diamond leads, so he had at most one heart left. I pitched a heart on the ace of spades, cashed the king of hearts, and led a heart to the jack, knowing it would win. +2330, for win 14! Finesses only work 50% of the time. They should be your last resort. Nice play. Combine your chances, remember the bidding, and watch your entries - lots for a beginner to learn on a hand like this. I disagree fairly comprehensively with the assessment of West's lead against the doubled grand. It is true that West should only consider the bids in the auction, and not any emotional content that was attached. But he is allowed to consider the whole auction, not just the final bid. 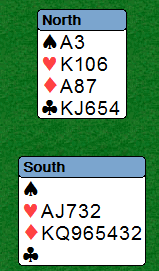 When partner has bid hearts, doubled 6NT, and then doubled a grand slam escape bid, the auction calls for a heart lead. It's that simple, and no ethical consideration enters into it. Obviously partner has the AKH, not because of facial expression or tone of voice or forcefulness with the bidding box, but because that is what his bidding has proclaimed. Leading anything other than a heart is idiotic. 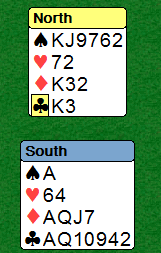 Very nice 7D, I thought you were gonna get a heart lead from the bidding. But your ending was much better.